Please consider taking the appropriate course survey (below.) Your feedback will help me improve my teaching. Let’s file this under biodiversity. Here’s a website with just pictures of cute animals. JustCuteAnimals.com just has pictures of cute animals from domestic to wildlife. Awwww!!!!! Seniors, this is it! Congratulations on all you’ve accomplished! Juniors, you are doing great, too…and you’re about to be the seniors. That’s awesome. Before the year ends, you have your exams. Below are the senior and junior exam schedules. All of my physics classes will take their exams during their regular class period and not the lab period. Sixth period: You will take your electric circuits unit test on Wednesday. (Third period has already taken their version of it.) We will spend the remainder of the week covering special topics of interest and perhaps reviewing for the final. No more bananas? A fungal disease is spreading globally that is wiping out farms that produce the banana we are all used to, the Cavendish banana, and extinction is a distinct possibility. This has actually happened before to another supposedly more delicious banana variety, the Gros Michel banana, which went extinct from a similar disease in the 1950s and was replaced by the Cavendish. Other banana varieties exist, but they are decidedly different from the yellow beauty that for so long has been standard grocery shop fare. The situation highlights the practice of monoculture, or cloning a species so that every plant grown is exactly the same…helpful in some ways, but when one plant is susceptible to a disease, they all are. This is certainly an example of how science impacts economics, politics, world hunger, and so on…What do you think about it? SENIORS!!!! THIS IS YOUR LAST FULL WEEK OF HIGH SCHOOL!!!! THAT IS SO EXCITING!!!! CAPS LOCK IS ON!!!! P.S. Juniors, you still have one week to go after this. Caps lock is off. We will spend some time preparing for our CEDAR POINT LAB ON THURSDAY!!!! (CAPS LOCK IS ON AGAIN!!!!) With the remaining time we’ll finish our unit on electric circuits by completing assignment 4 on Monday. Third period, your circuits test is Tuesday, whereas sixth period will their test when announced. We will present our research on the planets and discover asteroids, meteors, and comets. We may have a test by the end of the week. Since we’re heading to Cedar Point in the physics classes to apply what we’ve learned to the real world, why not try your hand at designing a coaster of your own? There are many online sims, including this one and this one and this one and this one and this one! Students in AP classes, please remember to let me know if you need some flexibility from me so that you can focus on your exams. We will complete our unit on electric circuits. On Monday we will complete assignment 3 followed by a quiz as announced. (If you were in an AP test this past Friday (May 9), be certain you’ve caught up on the parallel circuit podcasts, since those are the notes you missed.) For Tuesday please take notes on Podcast 7 – Compound Circuits. We’ll spend some time analyzing series, parallel, and compound circuits followed by an exploration of electric power, real-life wiring applications, and circuit safety features. Please take notes on Podcast 8 – Electric Power and Podcast 9 – Circuit Safety Features when assigned. We will finish the unit by completing assignment 4 in preparation for the unit test at the end of the week. Long-term work: We delayed our test on the universe unit until after AP exams, so it is this Wednesday. Next Monday your unit 3 outdoor lab on the moon is due. (We did push the due date back a week because of cloudy weather.) This week we soar through the solar system, which will include a research project with presentations. Unlike your past explorations of this topic, you will learn how the planets appear to move in our sky so that you can find them and impress your friends. The time for outdoor awesomeness is upon us, so check out this invisible bike helmet! We are getting close! As this is the first of two AP testing weeks, please let me know if you need me to be flexible with you about due dates. Preparing for all of your tests is important. This is a pretty rock, right? Well it’s also making news! Geologists regularly discover new minerals. However, most newly-discovered minerals bear strong resemblances to the characteristics of known minerals. 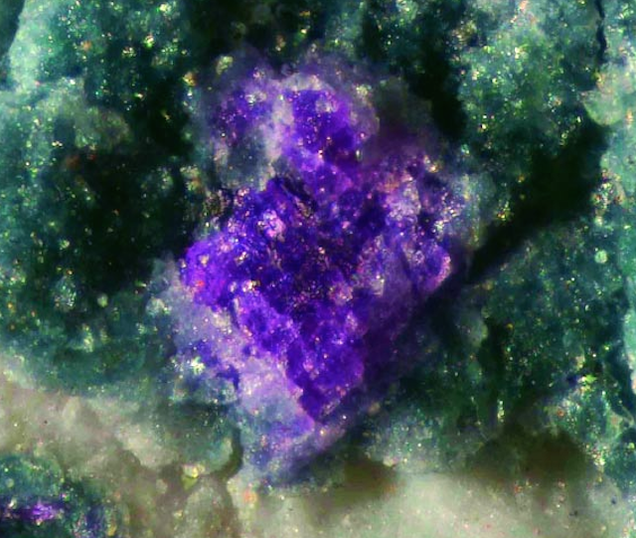 This pretty purple noob mineral that scientists just discovered in Australia consists of a chemical combination never before seen in nature. That rocks!